In our righteous defense of "simplicity," some of us in the old school movement, myself chief among them, have given the impression that any kind of mechanical complexity is both unwarranted and unwanted. I know that this is so because I've often seen outsiders to our little echo chamber think, based on a reasonable but mistaken reading of our various discussions, that "old school = rules lite." Now, it's certainly true that while many old school games, such as LBB-only OD&D, would likely qualify as rules lite under many contemporary definitions, it's not OD&D's relative lack of rules that draws its proponents toward it but rather the kinds of rules it includes and the way those rules are presented. Conversely, many games I'd unhesitatingly call old school, such as Chivalry & Sorcery, aren't rules lite by any means (and even AD&D is fairly complex by most definitions). In reflecting on my experiences with Rolemaster, I realized that it wasn't really the inclusion of lots of charts that made it so difficult for me to play. Rather, it was my unfamiliarity with those charts. I have known many ardent players of Rolemaster and most of them didn't think much of my claim that the game is "unplayable." Ditto for fans of DragonQuest. In both cases, what I often heard was some variation on "once you get the hang of it, it's really not so bad." I used to think that was self-serving nonsense, intended to brush off my criticisms without actually addressing them. Now, I'm not so sure. I'm not so sure because many of the games I played regularly as a kid, like AD&D as I mentioned above, are in fact quite chart-heavy and intimidating to people who aren't familiar with their rules. And yet I'd defy the opinion of anyone who claimed, with a straight face, that 1e was "unplayable" because of its charts, matrices, and many lists: "Once you get the hang of it, it's really not so bad." In fact, many of those charts, while assuredly off-putting at first glance, serve double duty as rules references and rules explications. AD&D's combat charts, for example, really helped me as a younger person to conceptualize the levels of "fighting-ness" of the various classes, which probably explains why I never really bought into the "thief-as-combat-god" notion so many gamers seem to have these days. Now, I can certainly sympathize with gamers who dislike charts or find them impediments to their enjoyment of a game. I have lots of little hang-ups about which I feel the same way, so I know exactly what that's like. But there are gamers for whom charts aren't a problem and indeed for whom they're of genuine assistance. Likewise, for certain kinds of games, charts are even a necessity, helping to make them simpler to play than one might think at first glance. Nowadays, those types of games aren't my cup of tea, broadly speaking, but I have played and enjoyed such games in the past and -- who knows? -- I may do so again in the future. Charts and matrices are no better or worse than any other rules presentations in absolute terms and, situationally, I've often found them a positive boon. So, I'll be doing my level best to resist my current instinct to recoil upon seeing them. Charts have been with us since the beginning of the hobby and they're a salutary method of presenting information in a compressed fashion. Like everything, they're a tool and they have their place. To suggest otherwise is to demonstrate precisely the kind of close-mindedness for which old schoolers are often criticized. Speaking only for myself, I'm going to try to be more tolerant of charts and tables and remember well that they have as much claim to being old school as the simplicity so many of us laud these days. Where does the chart in the graphic come from? It looks like one of the old "Top Secret" (Non-SI) melee/unarmed combat charts. They could have benifited from a more detailed explanation of the manuevers, but they DID cover a wide range of results and Offensive/Defensive inputs. Yeah, charts are ok...it's matrices that really make me vomit! Nice use of the word "salutary." Incidentally (although this might bring a die-hard fan out of the woodwork), if you want to see an old-school game that actually might be unplayable due to complexity, see if you can find a copy of Avalon Hill's Powers and Perils. To this day I don't think I've ever fully understood it. When I was 10, it was like trying to read a game published in Latin. Oh, we tried to play P&P once. We were making characters, and all the players rebelled at the algebraic formulae at the bottom of the character sheet. Yep, we used to call it Chartmaster but after we got used to it, handed out copies of a PC's charts to their player, bookmarked pages, etc. It went pretty quickly. Then it got bogged down with too much stuff from the Companions. I've jettisoned some of that and now it runs well again. Chart == Table for purposes of this comment. For "complex" rules or lots of data charts are one of the best (compact, quick to scan and use) presentations of those rules / that data. [DMing] I prefer primary systems (like combat) and everything that comes up often during play to be simple enough and few enough in number to keep in my head. That's just me. But mortal wound chart, what happens if you stay overnight in mythic underworld, wandering monsters, treasure tables, etc. Those are all perfect uses for charts. For various reasons I've never been able to effectively use a DM Screen as reference. So, charts really bog down my game. I feel D&D should be (I like it to be) fast and loose. I think actually that AD&D prepared me well for rolemaster, which I moved to. I remember many of the players knew exactly which page of which book to look at to find, for example, speed factors, damage, poison rules, etc. We were well aware that with familiarity even complex processes become very simple, because it's the remembering that's difficult, not the thinking. AD&D had lots of charts but it also had the same problem as rolemaster - the rules were scattered across so many inconvenient locations. So when I moved to RM it was the same - I put a bookmark in the manoeuvre tables and base spell attack tables, then used the law books for everything else. And the thing that slowed me down most was knowing where in which book to look - not the size or complexity of the charts themselves. My single biggest gripe about those books was that the weapons weren't in alphabetical order, so you could never learn your way around them quickly. Had they done that, the combat would have been so much easier to get used to. Charts present a lot of data, but data isn't the same as complexity. Rolemaster (before you add the companions) is actually probably less complex than AD&D, because all its charts are basically the same thing: pick the chart for your attack, roll and find the column for the target. Master that one procedure and you're ready for just about anything. AD&D has charts for this, and charts for that, formulas for this, lists for that and written rules for the other; there's no organizing principle, you just have to brute-force memorize which things require look-up, which require calculation, etc. It's not unplayable but it's a lot to keep in your head, and I've never encountered a group that used every last bit of it, weapon speed factors and all. The old Rolemaster critical hit charts were by far and wide the best ever made. Nothing like falling and fumbling over an unseen imaginary undead turtle while the enemy criticals you and lobs off your hand while saying TAKE THAT! Charts only slow down the game if you use them to run combat and other actions. That's why I avoid/ minimize hit location tables. 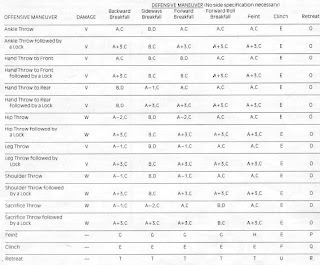 What I have to make storytelling go smoothly are a "Party Saving Throw" Chart - weher each PC's throw is listed agaisnt each form of attack, "Party to be hit by monsters" Chart, and "Party attack chart" - all the numbers prefigured before the game with all the modifiers, Missile attacks listed separately, for each range. All I need to know when runnig combat is the monsters AC and hp and the distance of the encounter. One added stat is the "Weapon Reach" column: fist/dagger; short sword, longsword, two handed sword/berdiche, spear, pole arm. This si te only additon to make my famous deadly Customized Combat System possible. Word Verification: Coyfilb - pat of the crystal ball that receievs the image. I know that this is so because I've often seen outsiders to our little echo chamber think, based on a reasonable but mistaken reading of our various discussions, that "old school = rules lite." In fairness, doesn't the fellow at Greyhawk Grognard believe something similar? It's not just 'outsiders' who feel this way. I understand the point you're making, and I appreciate your ironic use of 'echo chamber' here, but this really is a running theme in return-to-the-old-ways narratives of every sort, not just OSR testimonials. From reading the title, I actually thought this post was going to say something else. I am not rules-light by any means, but I hate excessive chart usage. Note that I say excessive chart usage. That is what distinguishes Rolemaster from D&D. I like formulas. One you know them, they are faster than tables, particular if the rules require more tables than will fit on a GM screen. They are also easier to balance and analyze. If you know anything about probability, you can determine how an ability power will scale over time. And the latter is the only reason I buy rules made by other peopl,e instead of making my own -- the designers have tested them and know how well they work. The only time that I think that tables are absolutely necessary are for random event generation. Like a Wand of Wonder. But most of the time, whenever I see a table, I think the classic "wandering damage" tables from Dragon years ago. The number of rules and/or charts is less important than the learning curve. AD&D had a lot of rules and a lot of charts, but you only needed to understand a few of them in order to get started playing, and many of them could be and were safely ignored altogether. In particular, I look at the DMG as less of a rulebook and more of a series of essays and articles suggesting how the game could be played, and I think that's how most players treated it whether consciously or not. My biggest pet peeve with the DMG is that it didn't reprint the combat charts that were in the middle of the book as a final appendix at the very end, as was done in the PHB. Using charts instead of explicit formulae can speed up play, but only if the charts are where you need them when you need them. Then again, I guess TSR expected to sell a lot of Dungeon Masters' Screens to compensate. Furthermore, the charts used in D&D in actual play tend to be matricies that give you a pass/fail target number based on two inputs (e.g. attacker level versus AC). It wasn't really critical to get it 100% right. Without the tables in front of me, I could simply say that your 1st level fighter needs a 14 to hit the goblin. If I'm wrong and you really need a 13, then I guess the goblin was wearing the equivalent of scale armor instead of studded leather; if you really needed a 15, then I guess the goblin's armor was just leather, or maybe was in bad shape. Either way, we keep the pace of the game going, and any errors will be of too small a magnitude to matter to any but the most obsessive or competitive players. I prefer my players' game stats in pre-figured charts because the firmulas require to stop and figure, and that interrupts the flow of narrative. I can keep on talking even as I am looking for the to hit number that needs to be rolled. Charts are fun! Probably my favorite thing about old RPG books.